I love this cover. It has all kinds of interpretations once you've read the book, and I've enjoyed contemplating all of them after the fact. Linda Gillard's novels have become comfort reads for me when I'm looking for quietly moving stories with a hefty amount of substance to match the touching moments. I would not categorize any of them as "cozy" reads. There's far too much pain and history in them for that. Rather they are meaningful and full of thoughtful explorations and characters whose feet are a bit more rooted to the ground than you sometimes find in similar novels of a lighter nature. Having read and loved Ms. Gillard's first self-published novel House of Silence, I was nothing but excited when I heard she had another coming out just a few short months later. On an only slightly related note, do you ever bemoan the fact that you've never had the chance to run hell bent for leather through a field in a wedding dress? It just never occurred to me on my actual wedding day, and now I'll never know if it's as headlong and romantic as it looks on covers such as this one. Alas. Fay left her husband. But then he left her first. And so sometime around about the hour of his greatest need, Fay checked out. Unfortunately for the two of them, it turned out to be the hour of her greatest need as well. They neither of them were up for supporting the other through their particular trials. Not anymore at least. And after more than a decade of marriage as an army wife, Fay can barely hold herself together, let alone her husband Magnus who suffers from severe PTSD after being invalided out of his career in bomb disposal. And so she calls it quits, saying farewell to the guilt, the bewilderment, the talking her husband off a ledge on a regular basis. And she moves into their apartment in Glasgow and starts a career as a textile artist. Their daughter Emily chooses to stay with Magnus in the crumbling tower he purchased with the lofty intention of restoring it to its former glory. And life goes on. Then several years later, Magnus attends one of Fay's exhibits and the whole messy business rears its ugly head. Emily is getting married. So the estranged couple is forced to act polite and attend the requisite functions. Despite her reservations about Emily's choice, Fay believes she's up to the task of playing mother-of-the-bride. What she may not be up to is the task of watching Magnus get married, too. But then Magnus may not be either . 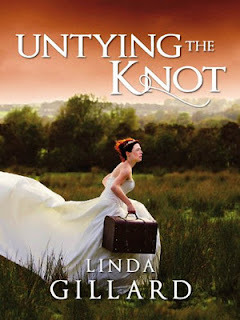 . .
Linda Gillard's books always make me feel. They make me feel more than I expect to and in very different ways than I think I will. In short, they're more than meets the eye in the very best kind of way, and they surprise you even when you think you have a handle on the author's style. I absolutely loved where Untying the Knot began. Two people in a room with such back story between them it fills the air with so much regret and uncertainty you could choke on it. Then it goes and unfolds so very slowly that you're half in love with Fay and Magnus before you even realize just how exactly and in what particular order the components of their marriage came apart at the seams. But by that time you love them, and you're not willing to condemn either party for what happened. Not until you find out the cold, hard facts. And, of course, even as you're waiting, you hope against hope they'll be able to reconcile, that they'll wake up and realize they're still in love with each other and can somehow live together again. It's a tall order, all those feelings. And Ms. Gillard admirably resists the easy path. And the cold, hard facts. Because though the ancient stones of Tullibardine Tower are both cold and hard, what lies between Fay and her ex-husband is not. It fairly seethes with life, messy and unfinished. The road to redemption is painful at best, and I felt a bit wrung out by the final pages, almost wishing it had resolved a bit sooner. The ending felt just a bit off. Both slightly overdone and anticlimactic at the same time, as if it were trying to atone for making its appearance so late in the game. This may just be my own lack of stamina, because it was the only complaint I had of a novel filled with beautifully thorny relationships, true love, not a little bit of hysterical humor, and that lovely writing I've grown so fond of from Linda. The truth is I will read anything she writes, and that's all there is to it. I've never read one of her books, but your review makes it sound like the sort of book that I'd like. Although, truth be told, I would never have picked it based on the cover! I would never have guessed this would be one for me until I read this - thanks, Angie! I've never read one of her books but you write such lovely reviews, Angie. You make me want to read everything you do, whether you liked it or not! Thank you so much, Angie for this fabulous review. :-))) I've waited anxiously for this one, because, as Jenny says, you make people want to read! I love a well written book...And I love finding an author that I can depend on. I'll have to give this one a try...After all the Christmas Romances I've been devouring this month I think I'm ready for something more contemporary and more complex. Great review. I think there were many reasons you didn't think to run through a field in your wedding dress....not the least of which you were so sick you could barely stand.....You were the most beautiful sick bride EVER. Merry Christmas. We miss you all!!! ahh! this sounds just so fabulously brilliant. and now i am SUDDENLY dying to read this book even though i had never even heard of it. bb, my pleasure! I love spreading the word on Linda's books. They're winners. If you like what you find, give EMOTIONAL GEOLOGY a go. It's my personal fave. Jenny, what a kind thing to say! Like I said, you really can't go wrong with these books. librarian, isn't it the best thing ever? Like coming home. As I said above, EMOTIONAL GEOLOGY is my favorite of hers but I've enjoyed the hell out of all of them. Any good Christmas romances I should look up? Liz, LOL. I would laugh so much more if you were around. Coming up on our anniversary, I've been thinking about that day a lot.